A review is to be carried out of a horse fair event after a pony and cart collided with two cars after it overturned. A man and woman were left with minor injuries and a parked car and another vehicle standing in waiting traffic were damaged after a pony was spooked as it took part in today’s trot parade. The incident happened shortly after noon as the procession of horses travelled through South Hetton from a field which has been hosting the horse fair over the bank holiday weekend. As the group headed down the hill on Logan Terrace, the trap overturned, with the horse then running loose across an area of grass before it was caught. All those involved have exchanged details, with the cause of the collision, which was witnessed by police, being looked at by officers. All those taking part were told to ride in single file, but several rode two or three abreast during sections of the ride. I’m really disappointed about it because all we want is for people to be safe on the roads and I will be feeding back to the community about what has happened. The horse fair, which was held on land in Seaham, Easington Colliery, Horden and Blackhall, has been held on private land off the A182 South Hetton Road in recent years and is expected to be held again in August. Sergeant Paul Footes, of Easington Neighbourhood Policing Team, said: “The organisers of this event need to take responsibility around safety on the roads and make sure that all the horses and carts that take part follow the rules of the road. “They need to because this is not a police or a council event. “During the weekend, there have been no incidents, overall it’s been fine. “But we have had one horse that got loose in South Hetton and has caused damage to two cars. 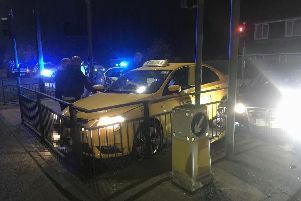 “I’m really disappointed about it because all we want is for people to be safe on the roads and I will be feeding back to the community about what has happened. Traffic management was put in place to reduce the national speed limit on the A182 from Hall Walks at Easington Village into South Hetton to 40mph, with signs also up to warn people of horses and carriages in the road. A temporary traffic light system was placed at the junction of South Hetton Road and Salter’s Lane to allow the horse and carts a safe turn as they headed to Haswell before returning to the field. Stakes were also put into the ground along the side of the road leading up to the camp to prevent people from parking up on the verge and paths. A number of residents turned out to watch the trot travel through South Hetton. One 40-year-old man who looked on said: “We always come out an watch and we like to see it, but the one in August is a lot bigger and that one is chaos. “It’s the traffic that’s the problem. “They need to have more police on. The organiser of the fair was unavailable for comment.